East Norway (actually southeast) is the region surrounding the capital Oslo, where the largest number of people live. Oslo totally dominates this region. Oslo and its airport at Gardermoen is the transport hub for East Norway. Roads and railway lines has Oslo as their focal points. All railway lines, including the airport express train, terminate at Oslo Central Station ("Oslo S"). Main roads E6, E18, E16 and Road 4 meet at or near Oslo S. Regional as well as long distance buses depart from the bus station next door to Oslo S. Oslo Subway (T-banen) has a main station underground next to the train station. Nor-Way Bussekspress (express buses), . Most express buses running through the region are operated by this company. 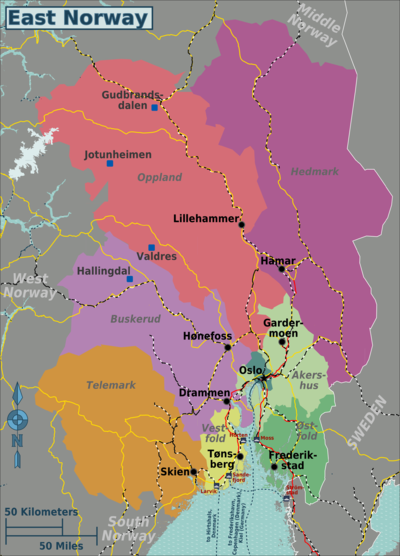 Connections to Oslo, Lillehammer, Valdres, Jotunheimen and Hallingdal edit. JVB (local buses), ☎ +47 61 36 59 00 ([email protected], fax: +47 61 36 16 00), . 08-16. Connections to Gjøvik, Gol, Lærdal and Gjende edit. This page was last edited on 18 June 2015, at 21:39.